What good is a haven if it doesn’t provide you a place to rejuvenate your emotions, body, and spirit? Give yourself permission to enjoy peace and quiet every day. If you take care of yourself, you will be better equipped to face the day’s challenges. I’ve occasionally let myself get so busy I got stressed out and didn’t take care of myself emotionally, physically, or spiritually. Big mistake! Having time to rejuvenate yourself is part of setting a healthy tone for your home. Create a small corner in your home where you can think or relax for a while. Place a comfy chair there with soft lighting and a candle, and keep favorite books, a gratitude journal, or magazines at the ready. Spend a little time every morning in solitude, and you’ll be much more equipped to face the day. In fact, I bet just seeing your quiet corner will lower your stress level. I often retreat to my own little world, where I can be alone with my thoughts, pray, and breathe in the silence away from the busyness of the rest of our home. A rejuvenation space can be especially important to a marriage. Staying at a quaint bed-and-breakfast is romantic, but that was rarely in the budget outside of anniversaries when we were raising our young family. So it’s always been important to us to create a sacred space right in our own home as a haven from the world. We decided early on in marriage that if we had the money, we’d rather save up $200 to invest in a room we can enjoy 364 nights a year in our home than spend $200 for one night away. Not to say we didn’t like to get away or take vacations, but our priority was to create a wonderful life right under our own roof. Because we spend much of our week connecting with people online, in person, at church, and at local coffee shops and restaurants, Jerry and I crave time alone at home because that recharges our energy. We pay special attention to filling our home, and especially our bedroom, with special mementos and furnishings that create a sanctuary for both of us every day of the year. Collections of artwork and accessories remind us of the getaways we’ve enjoyed through the years. We also surround ourselves with personal notes, art, quotes, and other special reminders of our romance to keep that part of our life a priority. We don’t have a TV in our room, but when we did we kept it behind our armoire doors. Scented candles, soft music, clean and luxurious sheets, and a tidy room all contribute to the feeling of an escape at the end of the day. In order to capture the true essence of a B and B, we have a lock on our door to keep family out. Mom of the year? Here is my thought on creating a getaway in our own house. You cannot have a true escape if you allow your door to be open all evening long. Even if you’re just enjoying a good book alone, you deserve a place to savor peace away from the hustle and bustle of your home. I enter my room and shut the door frequently just to hear myself think. If you do not have a lock but you do have kids, I encourage you to teach them about knocking on doors and waiting until they are invited in before entering. And even better, if you have kids old enough to read, make a sign for your door that reminds them that you are having a few moments to yourself. I know that isn’t really an option when kids are tiny, but once they are grade-school age, you can expect them to respect your privacy for a short while each day. This is important for your sanity, so don’t feel guilty about having your own B and B escape right in your own home! The outside world can be a stressful place, but with a little attention to our home and the way we live in it, we really can find that sanctuary we all need. 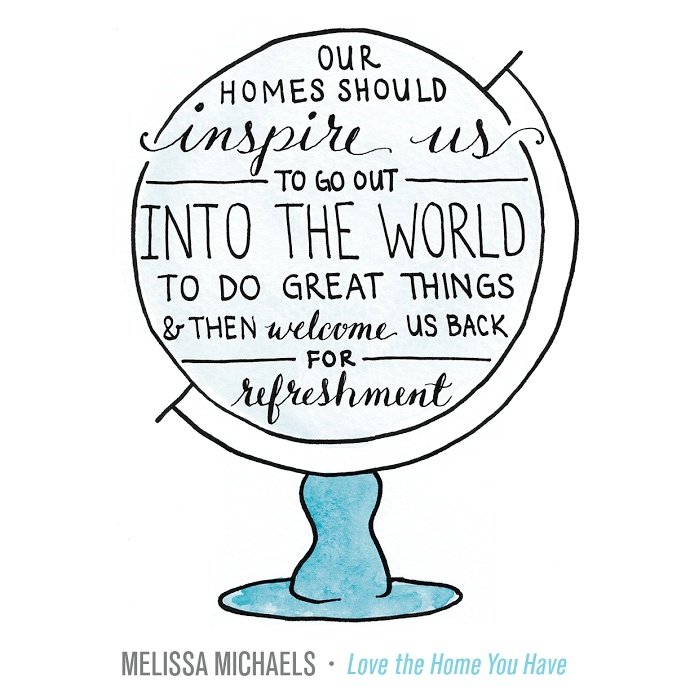 Our homes should inspire us to go out into the world to do great things, and they should welcome us back for refreshment. We give ourselves and others a gift when we create a home that inspires and even challenges us to be the people we want to be. Look around your house right now. Do you see sweet reminders of your gifts, accomplishments, blessings, and goals? Or are you overwhelmed by evidence of past mistakes and failures? Go through your house room by room and remove whatever doesn’t inspire you to be who you want to be. If something is a source of discouragement, out it goes! Better an empty room than a room that holds you back. Fill your home with things that lift you up, make you happy, and fill you with gratitude. Your home should be a reflection of all that is good in your life so you will be inspired to follow your dreams with confidence! Excerpt used with permission. All rights reserved. 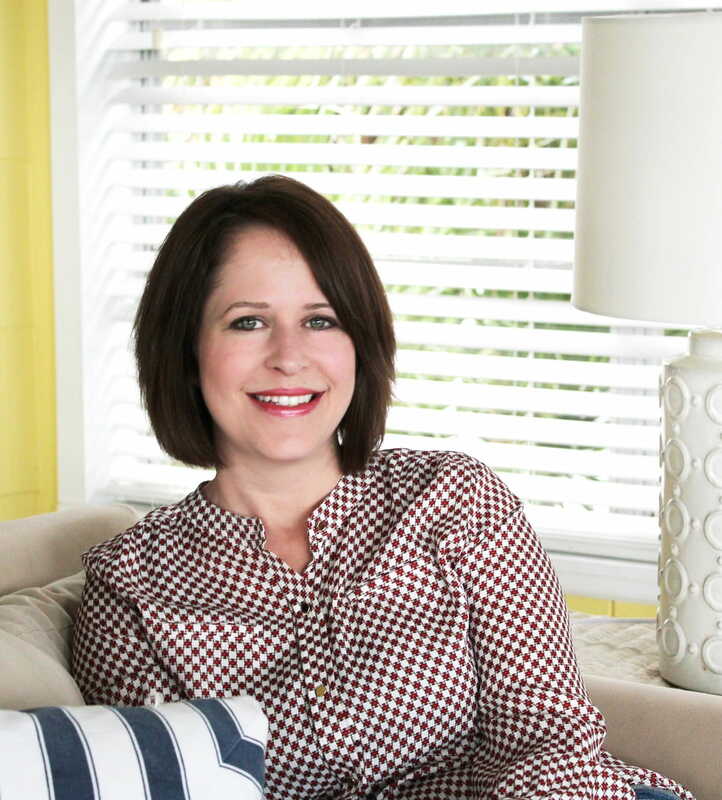 Melissa Michaels is the author of The Inspired Room (theinspiredroom.net), one of the top decorating blogs on the web for the past eight years. The Inspired Room reaches over 600,000 readers each month and was voted Better Homes and Gardens Readers' Favorite Decorating blog in 2014 and in 2015. Melissa (along with her home and The Inspired Room) has been featured in top publications and magazines online and in print. 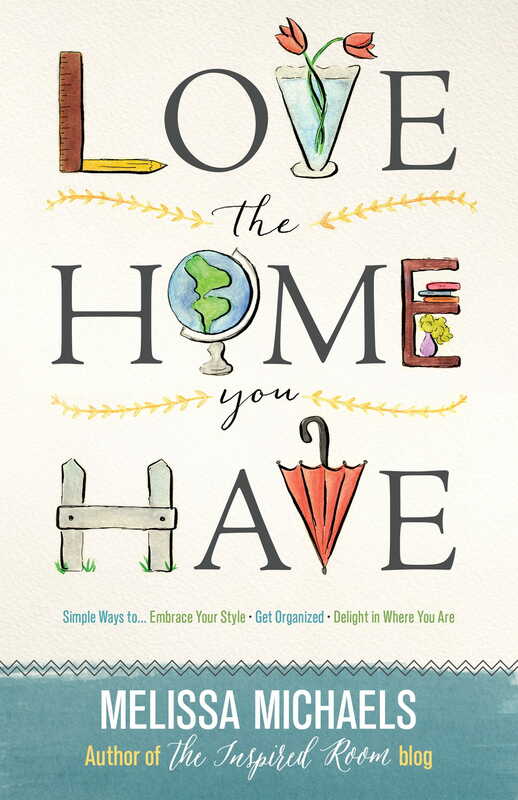 Through The Inspired Room blog and her upcoming books (Love the Home You Have, March 2015, The Inspired Room, October 2015), Melissa offers a refreshing perspective on finding contentment in creating an authentically beautiful home, right where you are. She lives with her husband and family near Seattle, Washington.